What duty do we have to stop others from doing wrong? The question is intelligible in almost any culture, but few seek to answer it in a rigorous fashion. The most striking exception is found in the Islamic tradition where "commanding right and forbidding wrong" is a central moral tenet. 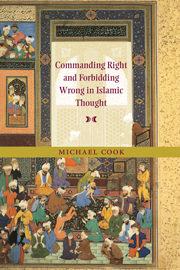 Michael Cook's comprehensive and compelling analysis represents the first sustained attempt to chart the history of Islamic reflection on this obligation and to explain its relevance for politics and ideology in the contemporary Islamic world. Part I. Introduction: 1. The goldsmith of Marw; 2. Koran and Koranic exegesis; 3. Tradition; 4. Biographical literature about early Muslims; Part II. The Hanbalites: 5. Ibn Hanbal; 6. The Hanbalites of Baghdad; 7. The Hanbalites of Damascus; 8. The Hanbalites of Najd; Part III. The Mu'tazilities and Shi'ites: 9. The Mu'tazilites; 10. The Zaydis; 11. The Imamis; Part IV. Other Sects and Schools: 12. The Hanafis; 13. The Shafi'ites; 14. The Malikis; 15. The Ibadis; 16. Ghazzali; 17. Classical Islam in retrospect; Part V. Beyond Classical Islam: 18. Modern Islamic developments; 19. Origins and comparisons; 20. Conclusion. "This work is one of the most meticulous studies of any aspect of Islamic thought and practice ever to have been produced...One wishes that a greater number of serious academic studies showed this work's combination of amazing erudition, clarity of expression, trenchant observation, and lightness of touch...Introductions to Islamic law and theology are fairly numerous now, but none is as engaging to read as this."